Meg at one of the lower waterfalls on the Cataract Falls Trail. Life is busy. Crazy busy. Luckily, Jake and I love exploring, and we had the perfect day last week to go on a little adventure. For our anniversary, Jake took the day off and we went for a hike up around Mt. Tam. Finding the trailhead to Cataract Falls was no easy feat, but we managed to find it just off a hairpin turn in the road. With just enough space along the side to park the jeep, we headed off for the ~3 mile hike, which was nearly straight up the whole way out. After passing a small lake, the trail comes to the bottom of the first of seven waterfalls. We hiked a little ways up, and then we just couldn’t help but to scale the moss-covered rocks along the sides of one of the falls. Though we quickly discovered our need for better hiking/climbing shoes, it was definitely an exciting adventure. We’ll be back soon, I’m sure! 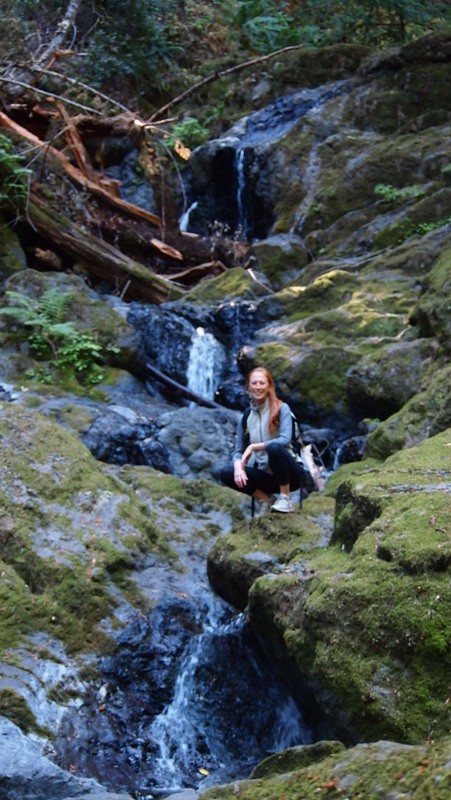 This entry was posted in Travel & Adventure and tagged Bay Area Hiking, Cataract Falls, hiking, Mt. Tamalpais Hiking, Northern California, trails in Marin County, travel. Bookmark the permalink. A few dollars for the right footwear will make your return trip even more fun, and safer, too.